When someone goes to build a new house, they generally have to look to several different vendors to provide them with the materials they need. All of the bathroom fixtures come from a completely different place than the windows, as do the carpet, ceiling fans, appliances, and everything else that makes a house a home. Asking for different types of donations is similar to the process of building that house. You can’t receive all of your donations online, just like you wouldn’t expect your sink manufacturer to supply the materials to construct a functioning fireplace. Instead, it’s wise to take a multichannel approach to fundraising, one that appeals to different demographics of supporters and helps your nonprofit raise as much money as possible. Let’s take a look at the tips you need before you start construction on your fundraising house. Unless you want a lopsided house with faulty wiring, you’ll want to bring a blueprint along to the construction site. 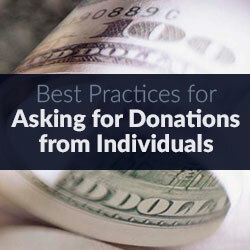 You’ll also need to do some research on your donors before you start asking them for donations. Prospect research essentially allows your nonprofit to have a look into your donors’ and prospects’ past giving history. It also helps you discover those tendencies that make them more likely to donate to organizations like yours. Past giving to other nonprofits. Real estate and stock ownership. Basic data like names, addresses, and marital status. With prospect research at your fingertips, your organization is in a much better position to start asking for donations from different types of donors. No two prospects are alike, and your nonprofit should do what it can to tailor your donation appeals to your various donors. Prospect research is a good first step in the right direction. 2. Go online and go mobile. If you thought that all of your donors would write a check, seal an envelope, and mail their contributions to your organization, think again. These days, more and more nonprofit supporters are making their donations online and on mobile devices, like smartphones and tablets. Is your organization part of that digital conversation? Provide your donors with an online donation page. Make sure that your website and donation form are mobile responsive and are therefore able to be viewed on all types of devices. Try using text-to-give technology to encourage donors to give during events and on the go. The options are nearly limitless when it comes to online- and mobile-giving technology. The only problem that comes with online and mobile giving is that it has the potential to isolate donors. Someone who gives through a screen doesn’t get the same experience that someone who donates in person or over the phone would get. Part of creating a positive online donation experience is connecting with your donors on a personal level and making the donation experience about them. Learn how your nonprofit can connect and empathize with your online donors with this helpful and insightful article. 3. 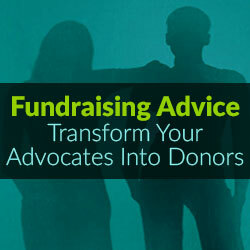 Transform your advocates into donors. Take a moment to think about your organization’s biggest supporters. Outside of your actual staff, your key champions are likely advocates and volunteers. Can you imagine if your pool of advocates were transformed into donors? While some of your supporters may be perfectly content giving their time to your organization, many others will be excited to help you further your mission with their donations. You might have a major gift donor in your advocate pool. Or you could possibly find a volunteer who will help you coordinate your upcoming phonathon or fundraising event. Whatever the case, it’s wise to take a look at your group of advocates and volunteers to see who would be willing to become a donor. Volunteers are valuable to all types of nonprofit work; their commitment is evidenced every time they go to work for an organization. Use this dedication to your advantage when asking for donations! One of the most important components of donor stewardship and retention is being grateful. When you make a donation appeal to an individual who has given to your organization in the past, make sure that you reference and acknowledge their previous gifts. This is crucial to your nonprofit’s fundraising process regardless of how you’re asking for donations. Make sure that all of your donation appeals are genuine sincere, and don’t forget to say thank you! 5. Don’t overlook corporate donations. So far, this article has focused mainly on asking for donations from individuals. But there’s an important demographic of donors that we can’t leave out of the equation. Companies like to exercise their corporate philanthropy in many different ways, and your nonprofit can be the recipient of that goodwill if you just ask for it! Okay, so that may be simplifying the process a little, but you get the idea. Do some research on the types of corporate donations that local companies might offer. You might find that your organization is a perfect fit for a corporate grant and end up scoring a long-term partnership with that business. 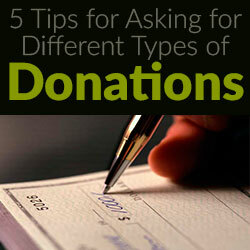 These five tips are not the sole answers to asking for different types of donations. There is a plethora of fundraising strategies and tactics out there that can help nonprofits of all shapes and sizes success when it comes to raising money. These five are a good starting point for any organization that wants to start generating more revenue and asking for donations from different sources. When Fundraising Gets Personal...Good Things Happen! Adam Weinger is one of the leading experts on corporate giving programs. He’s the president of Double the Donation, a company which helps organizations raise more money from employee matching gift and volunteer grant programs. The company partners with nonprofits ranging from arts and cultural organizations, hospitals, educational institutions, and community based organizations to help them increase fundraising from corporate giving programs. Adam is a frequent contributor to many leading nonprofit magazines and blogs, including NonprofitPro, Nonprofit Marketing Guide, Top Nonprofits,Nonprofit.About.com and of course, Double the Donation’s blog. Organizations looking to learn more about employee matching gift and volunteer grant programs should check out the resources the company provides which include lists of the top matching gift and volunteer grant companies. Have questions for Adam Weinger or Double the Donation? Email Adam or connect with Double the Donation on Twitter or LinkedIn.